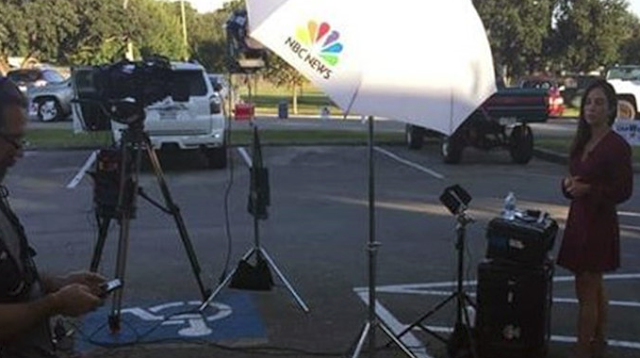 A disabled Air Force veteran posted photos online of an MSNBC news crew blocking handicapped parking outside an early voting place in southwest Houston Tuesday. “They should know better,” James Berrie, the veteran told KHOU-TV11. Berrie and his wife, Sarah, drove their van to the center for early voting. When they arrived around 8 a.m., the couple saw MSNBC blocking the only van accessible parking spot. So the Berries parked in a back lot. Cars crammed around the couple’s van left little room for Berrie’s ramp and power chair to move. Berrie, who has multiple sclerosis, said the crew agreed to move when confronted. However, 15 minutes later when the couple finished voting and returned outside the crew remained. “They had made no effort whatsoever to move,” Berrie said. “Their job is more important than accessibility. There were so many other places to do (their live shot). But you chose to do it here. We’re like, 'No. We gotta stand up.'" The couple asked MSNBC’s crew to move again. Even with help from a group of firefighters standing nearby nothing changed, Berrie said.